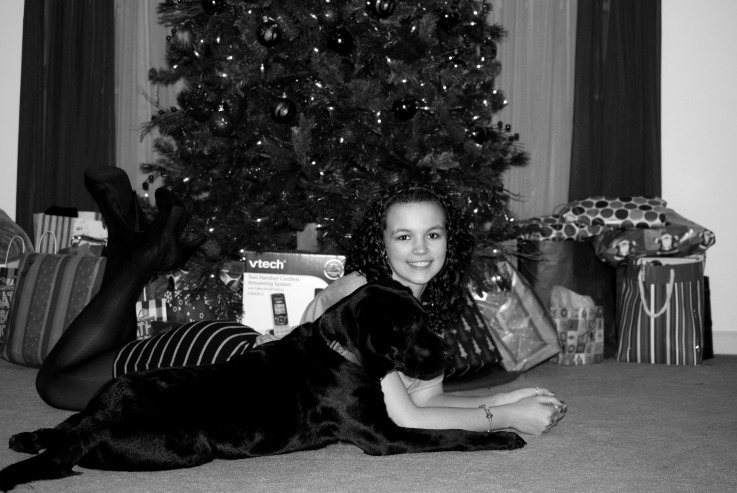 We hope that you, your family and your dogs had a wonderful holiday! Here's how some of the SSD dogs celebrated. Is this SSD Chamberlain? Or a reindeer? 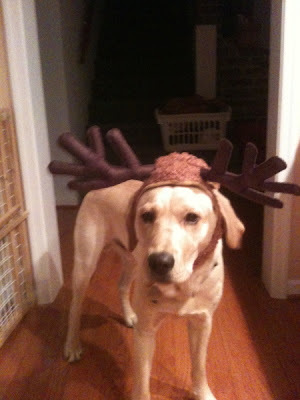 SSD Parks models her new antlers. SSD Grace is in the holiday spirit! 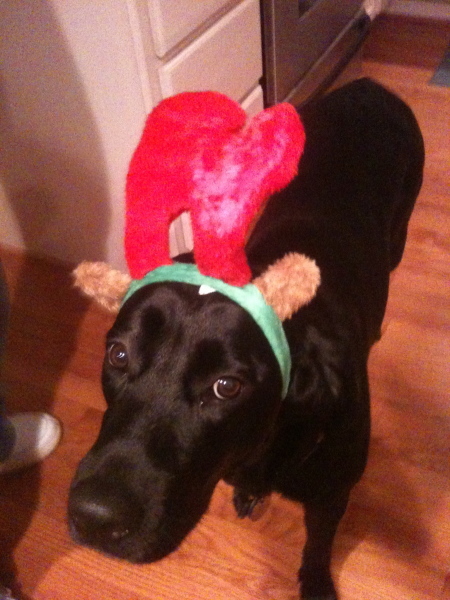 SSD Onyx also turned into a reindeer! 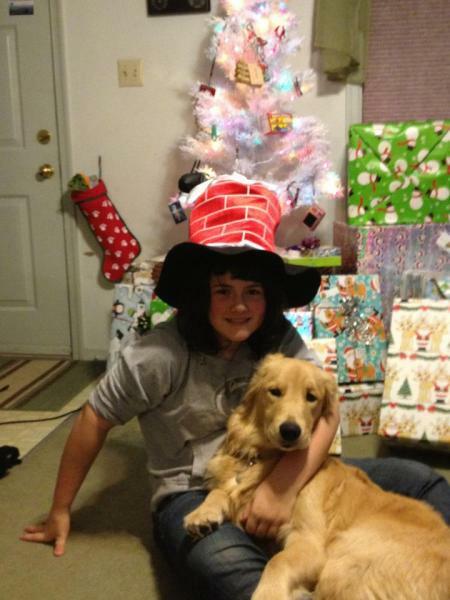 SSD Opal and her mom SSD Pearl pose in front of the tree. Every dog needs a special holiday outfit! SSD Opal models hers. New toy! SSD Parks loves it. Pearl gets a hug, the best present! SSD Quinn hides behind the tree. He's not quite sure why the tree is inside! SSD Ripley helps to pick out a tree. SSD Stanley was exhausted before the day even started! SSD Wish opens her presents. SSD Lil looks cute in her hat. 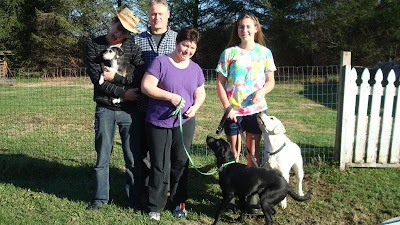 The Eastern Star puppies are going to their puppy raiser families tonight, just in time for the holidays! While raising a puppy is an exciting time, it can also add stress, particularly at this time of year. 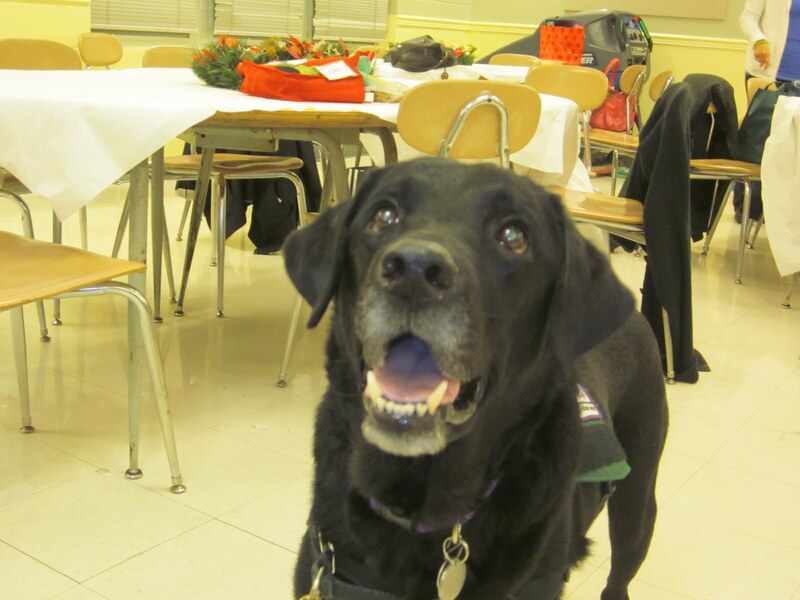 Here are some holiday safety tips to make sure that you and your dog have a joyful holiday. Be extra careful if you put up a Christmas tree. 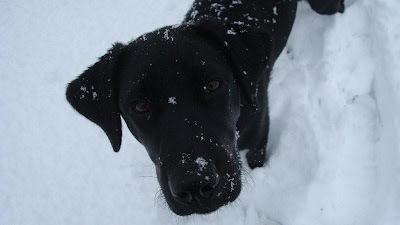 If dogs eat the tree or ornaments, they can get blockages in their intestines or worse. To keep your puppy from getting to the tree, you can surround it with a baby gate, or if you don't want to do that, put ornaments and tinsel above the dog's reach. Also, if you have a live tree, do not let your dog drink the tree water. There can be chemicals in it, particularly anti-freeze, which can be deadly to animals. Other seasonal holiday plants, such as mistletoe, poinsettias and lilies, can be poisonous to dogs in ingested. Keep them out of reach. The twinkle of holiday lights always brings out the holiday spirit, but be sure to keep cords away from curious puppies. They could chew on them and get an electric shock. The holidays are a wonderful reason to get together with family and friends and eat lots of delicious food. However, while that food might be okay for you, it could be harmful to your dog. Holiday foods are often rich and could give your dog vomiting and diarrhea. SSD dogs should never be fed people food from the table, counters, plates, etc. 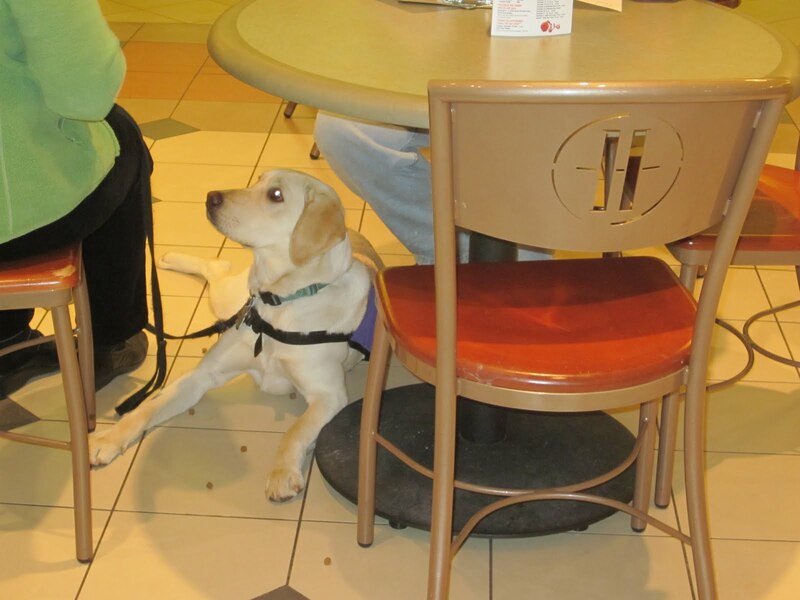 Part of their service dog training involves learning to chill out at people meal times. If you're having people over to your house, you want to make sure your dog can calmly greet them. This means that the dog keeps all four paws on the floor. No jumping and barking. If you have time, proper greetings are a good thing to practice before any guests arrive. It may be helpful to have your dog on a leash while guests are arriving, and be sure to have the clicker and lots of treats ready. When guests arrive, keep your dog's attention on you by giving him treats, especially if people are petting him. It may also be helpful if you talk to your guests before they arrive to let them know they should ignore the puppy if he jumps on them. Being around lots of people and activity can be very stressful for dogs. Make sure they have a quiet, calm place to go if all the excitement gets to be too much for them. Watch for the signs of stress, and if your dog starts exhibiting them, remove him from the situation. When dogs get stressed, they may pant more and will be more thirsty than usual. Give them free access to cool, fresh water. Also, it's a good idea to stick to your dog's routines as closely as possible. Continue feeding your dog on his normal schedule and take him outside for potty breaks and walks as close to your normal time as possible. And don't forget play time! Finally, make sure you know what your dogs are doing at all times, especially if you have a young puppy. By keeping an eye on him, you can often prevent him from getting into mischief and make sure that the holidays are safe and happy for everyone. Happy holidays from all of us here at SSD! "It's Time to Play the Music! It's Time to Light the Lights!" 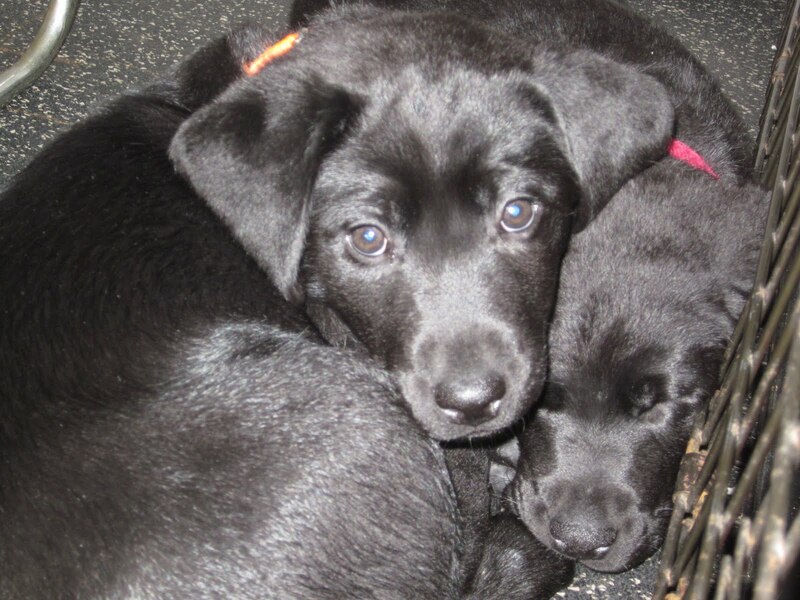 It's time to light the lights"
It's time to name the puppies of SSD Scotia tonight! These puppies are going to be the Jim Henson litter! Scotia was bred to Lord Byron of Kerrybrook, and according to her ultrasound, she's going to have 8-10 puppies! We need your help to come up with at least 10 puppy names based on Jim Henson's characters. Do you have a favorite Muppets, Sesame Street or Fraggle Rock character? Let us know in the comments! It could become the name of a puppy. Please suggest both male and female names, and feel free to suggest as many names as you like. We'll announce the names once the puppies are born. Have fun! We can't wait to see what you come up with! The names are official! SSD Dee's puppies are SSD Kindle, SSD Nook and SSD Odyssey! The fourth puppy was named SSD iPad. Although they're only a few days old, Kindle, Nook and Odyssey are already ready for the holidays! There are three new puppies in the SSD program! SSD Dee gave birth to her puppies on Dec. 13. Dee delivered her first puppy in the wee hours of the morning while she was still relaxing on the couch. After a nice nap, she gave birth to her second puppy at 5:30 a.m., and our whelping team was right there to assist her. When she was having trouble with the third puppy because it was so big, we decided to take her to the vet. Dr. Hann was wonderful and was able to assist the third puppy out. However, the puppy could not be revived. The fourth puppy was born by c-section. The third puppy who did not survive was buried in a special place at the home of one of our volunteers. Although Dee is a wonderful mother once her puppies are born, we decided that it would be best for her well-being to have her spayed. We're always excited to have more puppies, but we always consider the health and well-being of our dogs first. Dee and her three little puppies are doing great. Dee is such an attentive mother! We will be announcing the names of these three female puppies soon. Thank you to our whelping team and to Dr. Hann at the Palmyra Animal Clinic for taking such good care of Dee and her puppies! SSD Julia is only 10 months old, but she already took the public access test. No, she's not quite ready to be placed with a partner. 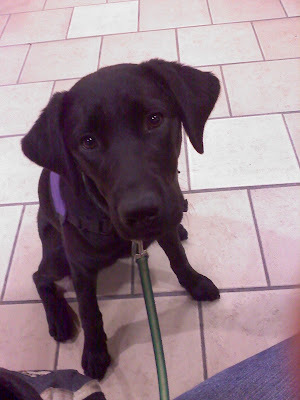 She simply took a version of the public access test as her puppy class semester evaluation. At the end of every semester, we evaluate the puppies' progress. Since we have this wonderful new space in the Harrisburg Mall for our puppy classes, what better way to see the dogs' overall progress than to have them take a version of the public access test in the mall? 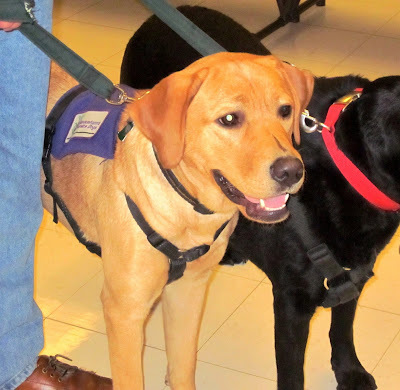 When service dogs and their partners take their public access test, it starts from the moment their partner opens the car door. 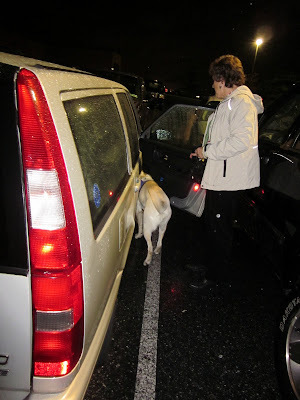 The dog must wait patiently until cued to leave the car. After the required potty break, the dog and partner enter the building. 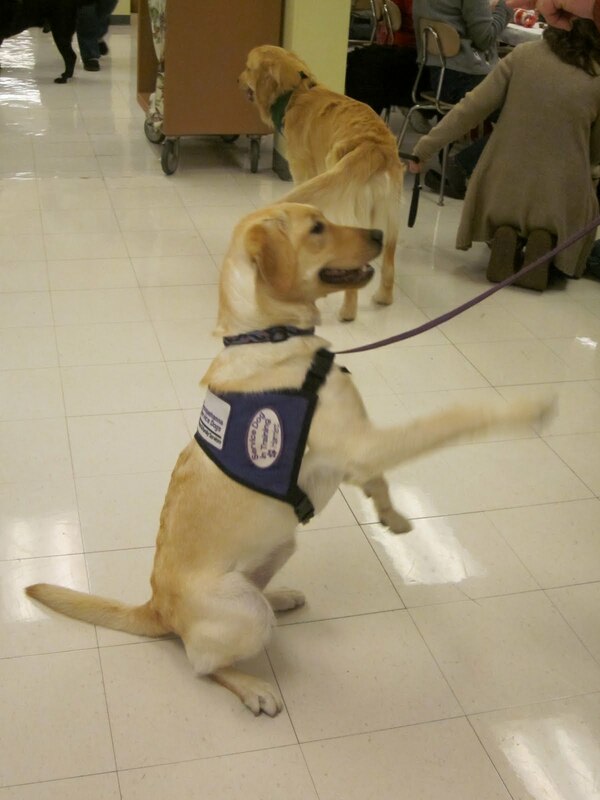 At the beginning of her evaluation, SSD Julia and her puppy raiser Susan demonstrated loose leash walking. Not only did Julia need to walk on a loose leash in open spaces, but she had to stay right next to Susan when then went around corners. Watch the video of Julia and Susan turning the corner around a kiosk. Listen to how often Susan clicks Julia for staying on a loose leash. Lots of reinforcement in a challenging environment means the puppy has a greater chance of succeeding! Another part of the public access test looks at the dog's ability to settle nicely under a table. For this, we headed to the food court. Susan selected a table and had Julia do a "down" so she was out of the way. Although she didn't go under the table, she was in a down between two chairs, so she was out of the way of anyone walking around the table. While in the food court, Julia also demonstrated "sit" and "down," with and without the distraction of food on the floor. 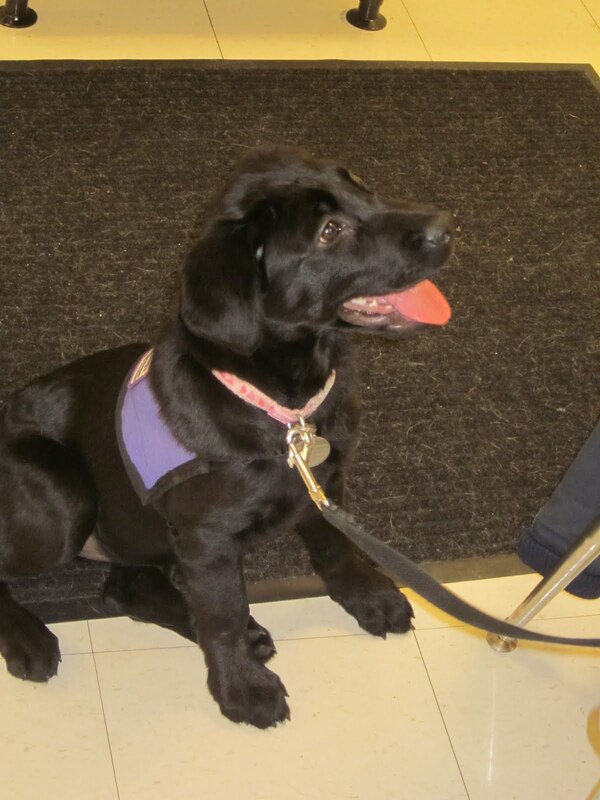 Since we have been working on the cue "lap" and having the dog get dressed in a comfort trainer, we added those skills to our puppy class version of the public access test. Watch Julia rest her front legs on Susan's lap. Note how Susan patiently re-cues her until she gives the correct behavior. 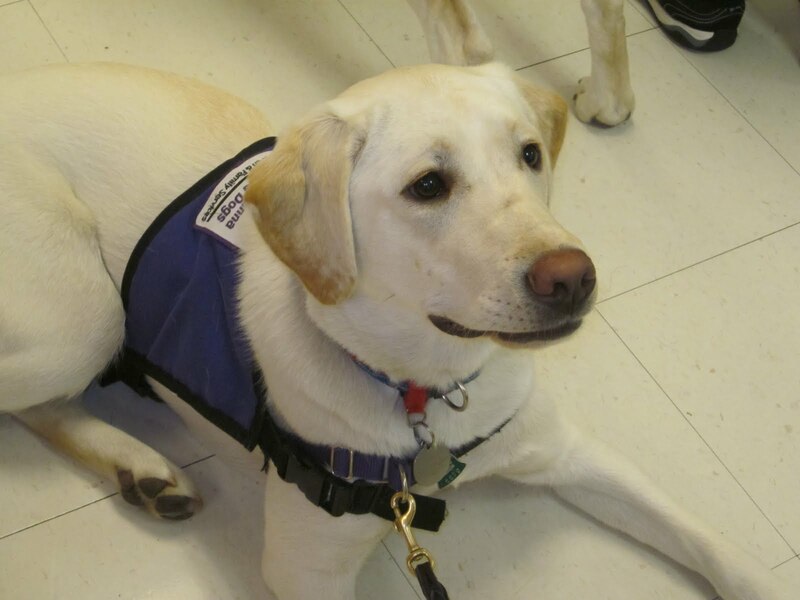 When our dogs are placed with their partners as working service dogs, they sometimes wear a comfort trainer to make it easier for their partner to handle the dog. Since we already have our dogs "get dressed" in their service dog harness, we thought it would be great if they could also stick their noses right into the comfort trainer. We actually got the idea from SSD Dylan's puppy raisers. 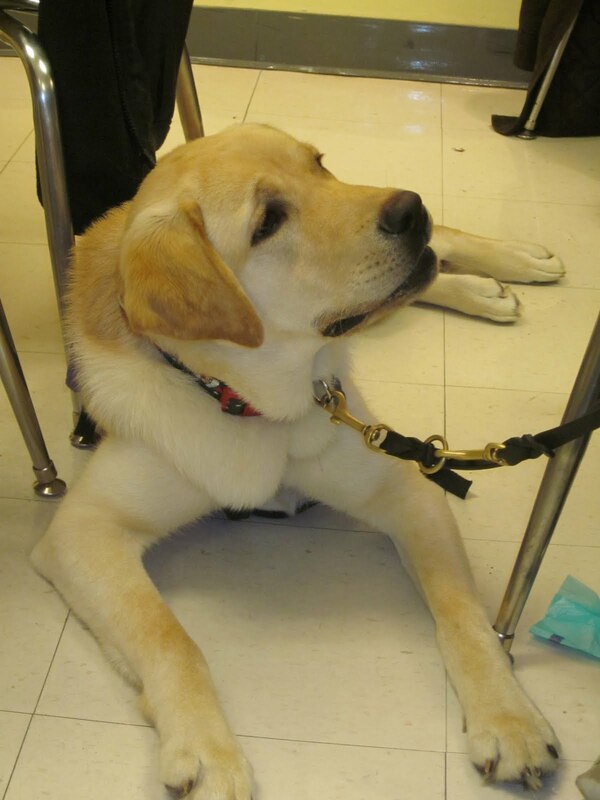 In one of their semester evaluations, they demonstrated how Dylan sticks his nose right through the comfort trainer to make it very easy for his puppy raisers to put it on him. In this video, Susan uses the loop of the leash instead of a comfort trainer to practice the behavior. See how Julia sticks her nose through the loop and stays there? We also evaluate the dogs' focus around distractions. While Julia was walking on a loose leash, we dropped a clipboard a few feet behind her. We also pushed a shopping cart around her. We even enlisted the help of a young boy walking through the mall with his older siblings. 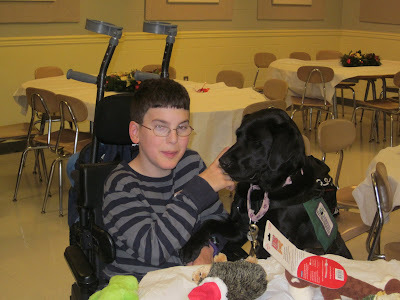 He got to pet Julia while she demonstrated how she can stay focused on her puppy raiser! Julia also had to demonstrate walking calmly up stairs and entering and exiting an elevator. We hope that by using the public access test as the basis for this semester's puppy evaluation that our puppy raisers got a better idea of what the dogs will need to learn before they can become working service dogs. 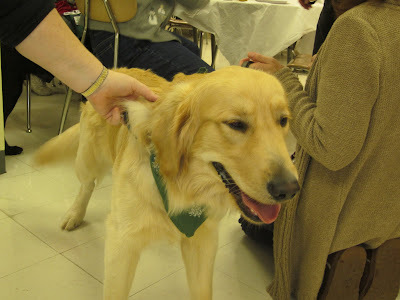 The semester evaluations are less of a test and more of a way to discover each dog's strengths and areas that need a little work. We're looking forward to the next semester and watching the dogs build on what they have already learned! Although this time of year can get very busy, it's one of our favorite seasons. Every December, many of our partners, puppy raisers, sitters and other volunteers get together for our annual Holiday Party. We love seeing this many people and dogs together! A big thank you to Candi and our other volunteers who organized the party for us! SSD Dee is going to have her puppies in the middle of December. That means it's puppy naming time! Since the vet says that Dee is going to have two puppies, Dee's whelpers decided that the theme for this litter will be Duos! Now we need your help coming up with names. We encourage you to think broadly when you're coming up with names. They could be people (Sonny and Cher), cartoons (Tom and Jerry), objects (salt and pepper), etc. Be creative! We don't know whether Dee's pups will be male or female, so please come up with duos that work for a female-female litter, female-male litter and a male-male litter. Also, there's a chance that there is a third puppy hiding behind its siblings. If you know of any good trios, feel free to include them as well! 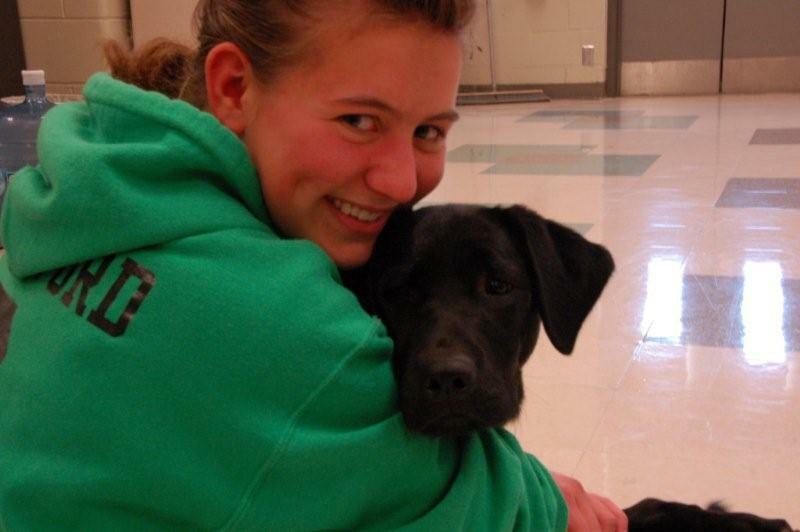 When she's not hard at work learning how to become a service dog, SSD Hale is a cuddlebug. She loves to lean against her puppy raisers, and she loves the cue "visit," where she puts her head in someone's lap. Hale has been visiting a lot of different places lately. She went to the movies last week, which really tested her ability to "leave it." The floor was covered in popcorn! She did well, though, especially considering that popcorn is one of her favorite treats. While she and Donna were walking, she left the popcorn alone. However, sitting in the theater with the popcorn around her proved to be a bit too much temptation. Other than that, she stayed in a down for the whole movie. While they were finding their seats, Donna took the opportunity to work on the cue "back" with Hale. "Back" is a little challenging for her. She sometimes just sits and scoots backwards instead of walking backwards. In the movie theater, Donna used the rows of seats to guide Hale in a straight line backwards. Someone had also suggested using the curb at the edge of the street. The curb works well because it keeps Hale moving backwards in a straight line without making her feel like she's confined in a narrow space. During the movie, Donna took Hale outside to potty once, just to be certain she would be successful during the entire outing. All of our dogs are trained to go potty or "get busy" on cue and Hale has certainly figured that out. In fact, if she doesn't need to go, but she's given the cue, she will still pretend to go and then look up at Donna as if to say, "See, I went. Now can we go back to doing what we were doing?" In October, Hale went to the King Frost Parade in Hamburg. Parades can be very challenging for dogs because of all the people, loud noises, strange objects, and of course, candy, but Hale did very well. She ignored the entire parade. She did get to practice lots of greetings. 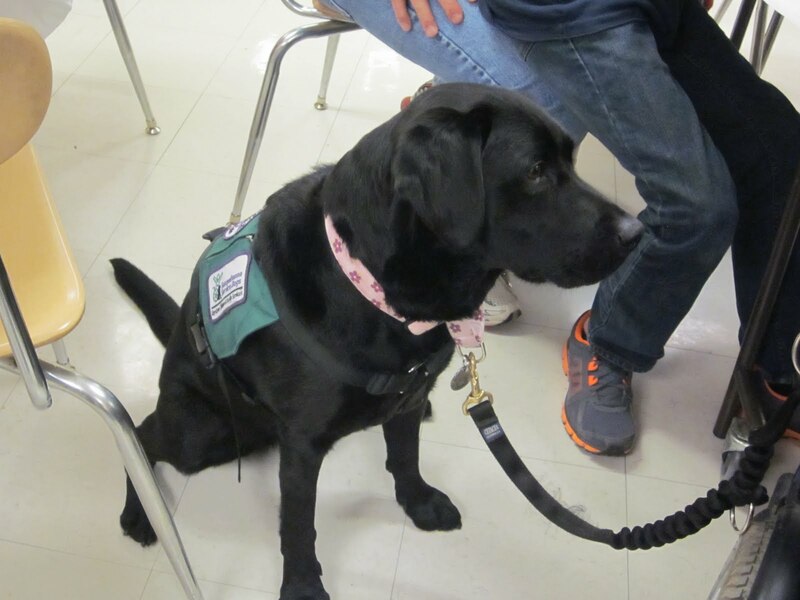 Donna has her sit when people pet her because she gets so excited that she wiggles and bumps into people, although she does stay focused on Donna. When Donna was first teaching Hale how to do proper greetings, she would click her for simply looking at her. However, Hale thought that they were in a shaping session and would then touch the person with her nose. (When we shape dogs for behaviors, we sometimes start by having the dog look at an object and then touch it with their nose.) Once Donna figured out what was happening, she started concentrating on her clicks and made sure she clicked when Hale sat. If you live in Pennsylvania, we're sure you remember the snow we had at the end of October. 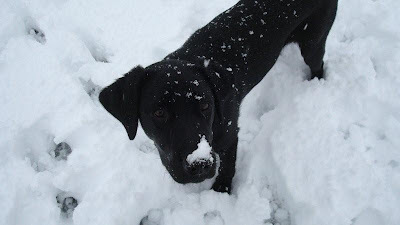 That was Hale's first snow! She had a blast playing in it! Hale also went with Lindsey and Donna to A.C. Moore for craft supplies. Lindsey was handling Hale that day, and at one point, she had to go back to a previous aisle. Instead of taking Hale with her, she put her in a down-stay and went to get the item she needed. Donna stayed behind Hale just in case. However, Hale didn't budge! She just watched the spot where she last saw Lindsey and didn't move until she came back and clicked and treated. Great job, Hale! Two weeks ago, the dogs in the Northeast Puppy Raising Program went to the Wyoming Mall for an outing. Hale was very well behaved, even though all of her dog friends were along. Donna frequently takes Hale to the mall, especially at this time of year, because it's a great place to practice stairs, going under benches, greetings and getting on and off the elevator. Donna always makes sure they take the elevator at least once every time they go to the mall, which is wonderful. 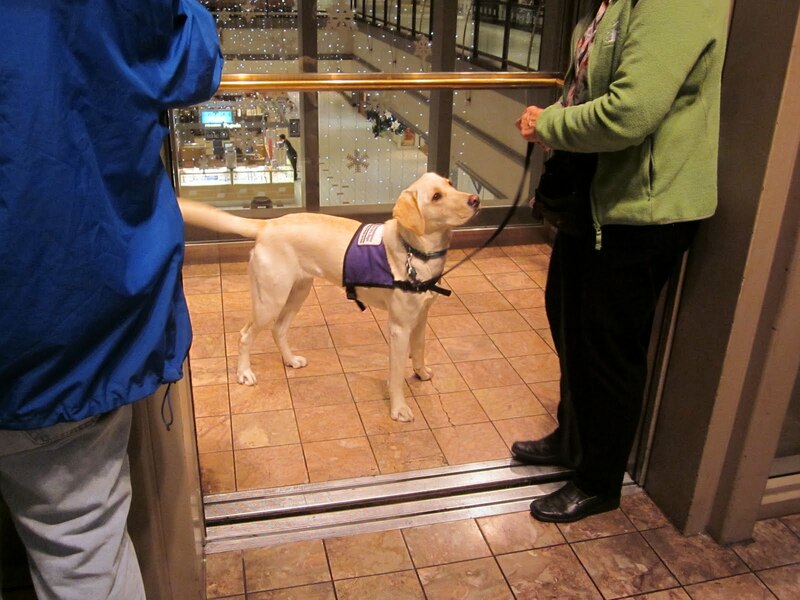 Service dogs need to be comfortable with both stairs and elevators. If the dog's partner uses a wheelchair or even if the elevator is simply the most convenient way to get from one place to the next, the dog must calmly enter and exit the elevator on cue. 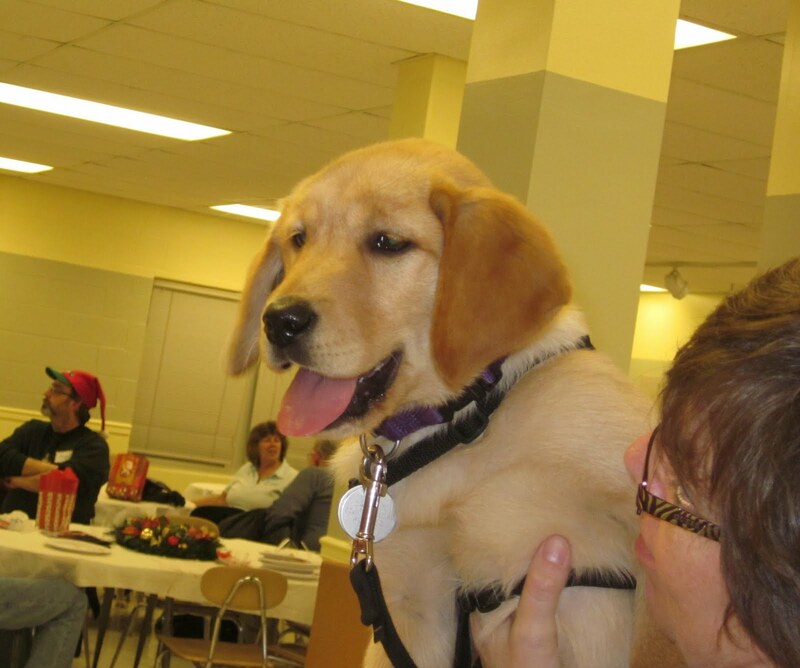 As our puppy raisers quickly find out, having a puppy in training is an instant conversation starter! 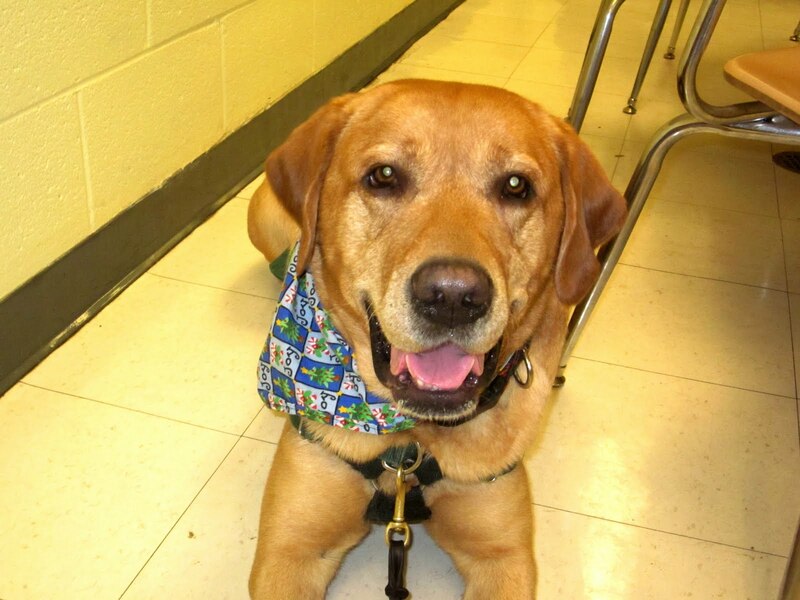 Donna took Hale to her 25-year class reunion and Hale did great! Donna set her up for success and they just sat at the table in the beginning so Hale wouldn't get overly excited. Once Hale seemed to settle in, Donna got up and mingled with her. Dinner was a buffet, and Donna went through the line with Hale. The dogs need to learn to ignore food whether it's on the floor on on a table right above their noses. To make sure the buffet was a success, Donna's husband carried Donna's plate so that Donna could focus on Hale as they went through the line. It was a good decision and it worked because Hale did quite well. She only tried to sniff the chicken, although she didn't get close to it. 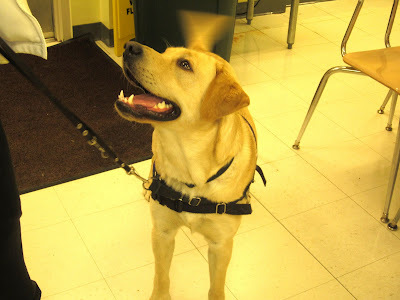 Although service dogs in training are working, they do have their silly moments. Hale saw herself in a wall-to-wall mirror at the reunion and got so excited that there was another dog there! She didn't bark, but she kept bumping her image and trying to figure out how to get around the mirror so she could get to this other dog! Recently, Donna took Hale with her to Wawa to get a cup of coffee. Donna dropped an empty cup by accident, but Hale was right there to pick it up! Several people saw Hale do this and Donna ended up having a great discussion about service dogs and how they can assist people. She used the empty cup several times to demonstrate how a dog can pick things up. While they were taking, Donna accidentally dropped her keys, but again, Hale picked them right up. The other people thought that was great! Donna does not use any cues for Hale to pick objects up because we will teach the dogs how to do that in a certain way once they're in advanced training. However, it's great that Hale doesn't seem bothered by having different types of objects in her mouth. Later that same day, Donna and Hale went to the grocery store. Everything went smoothly until checkout. Donna put Hale in a down-stay and began checking out, when her treat pouch came undone and all of the treats scattered all over the floor! Hale jumped right up to help clean up the mess. She must have thought it was her lucky day! But when Donna cued her to "leave it" and then put her in a down-stay, Hale listened immediately. She stayed there and watched Donna pick up the food. She only got up once when the cashier came around to help, but when Donna re-cued her, she went right back into her down-stay. Last week, the principal at the Votech school allowed Lindsey to bring Hale. Hale fit right in! She walked the hallways and didn't seem concerned about all of the students around her. In class, she tucked herself nicely under Lindsey's desk and settled down for a nap. Hale's training is certainly coming along! 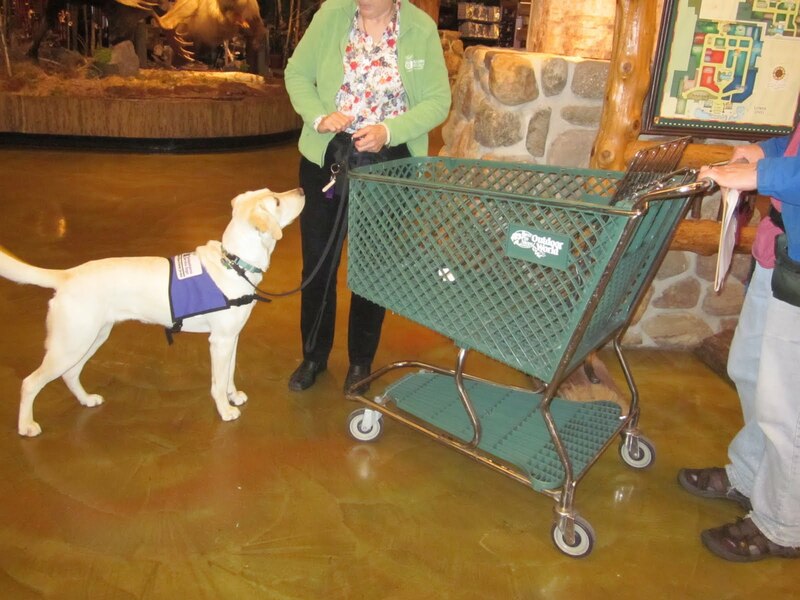 With the holidays coming up, she will probably have quite a few new adventures as she continues to learn the skills of a service dog.